The 2018 Fall Semester Refunds Disbursement occurs on the 5th Friday of the semester (September 21, 2018). Federal regulations state that the institution must process refunds (if a refund is due) within 14 days of disbursement (October 4, 2018). Please check your Web-Gate account to view if a credit balance is available, which will be sent to Bank Mobile our 3rd party servicer for handling refunds. Beginning this summer 2018 semester, full-time (at least 12 cr.hrs.) students could receive the maximum Pell grant even if they received maximum Pell awards for the Fall and Spring semesters. Awards are subject to the Pell LEU and SAP eligibility rulers, and students must be enrolled for at least 6 credit hours. READ MORE. Federal lawmakers recently increased the maximum amount for the Pell grant for the 2018-19 award year from $5920 to $6095. Students should monitor their Pell awards for the update by logging in to Web Gate. If selected for verification AND you have the FAS verification requirement on Web-Gate, click on the link from the Student Requirements page and follow the instructions. You will be directed to the FAS verification website at www.SSCwp.org. In addition, FAS will be contacting you requesting the information needed to complete the required verification process. Complete the verification requirements as soon as possible. You will be able to track what is needed via the website. Please watch for emails from FAS at verification@SSCwp.org and check your account often at www.SSwp.org. Your prompt response to all requests will accelerate the review of your request for financial aid. Questions regarding completing this verification process should be directed to FAS at 855-328-4400. You are now able to submit a FAFSA® earlier. The 2017–18 FAFSA has been available since Oct. 1, 2016, rather than beginning on Jan. 1, 2017. READ MORE. The District Financial Aid Department assists students in securing the funds necessary to pursue their educational goals at Wayne County Community College District. We are committed to meeting the needs of a diverse student body in a multi-campus environment by providing quality customer service in a timely manner through advanced technology and a knowledgeable staff. READ YOUR COLLEGE EMAIL AND WEBGATE MESSAGES REGULARLY TO RECEIVE ALL PERSONAL FINANCIAL AID INFORMATION. 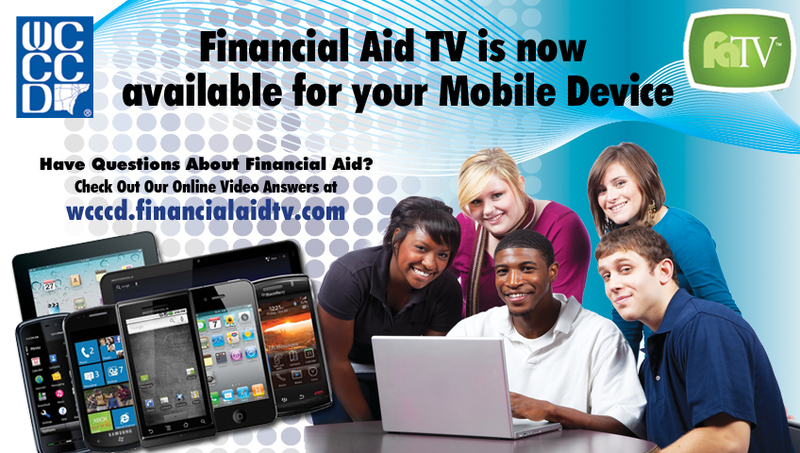 Financial Aid TV is now available for your mobile device. The Student Loan Management Center objective is to inform and provide support for students who borrow. We want to provide the tools and resources necessary to assist students with avoiding loan default. Students should review and accept Loan Terms & Conditions to remain informed. This requirement can be completed through Web Gate under the student requirements tab.